Soak the sheets of gelatine in cold water. Cut the goat’s cheese into small chunks. Pour the milk into a saucepan with the rosemary and bring to the boil. Remove from heat, cover and allow to steep until cool (approx. 30 mins). Remove and discard the rosemary sprigs. Heat the cheese and single cream in a saucepan. When the cheese has melted, remove from heat and add the gelatine. Mix well, add the milk and adjust the seasoning. Pour the mixture into glass dessert dishes. Chill for at least 4 hours. Garnish with crushed hazelnuts and chopped rosemary. 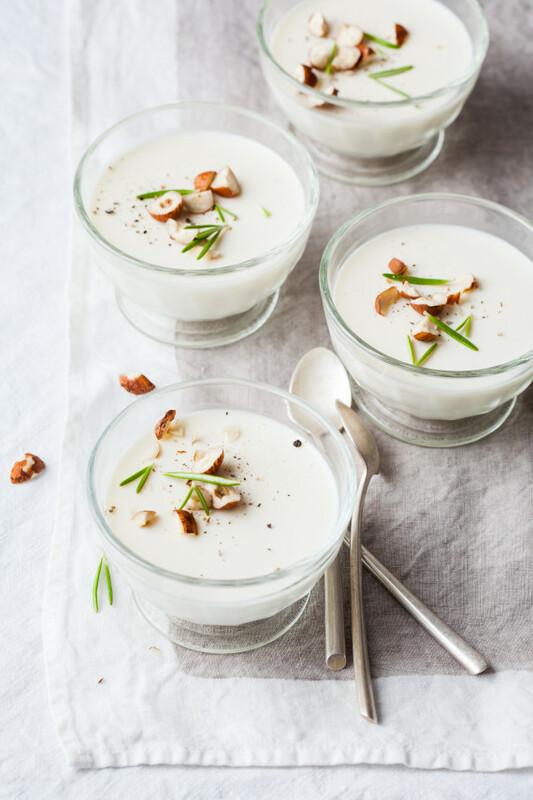 Serving suggestion: serve this panna cotta as a starter. Tip: you can replace the gelatine with agar if you wish. In this case, use 2 g of agar for every 50 cl of liquid and boil for 30 seconds with the cheese and single cream.